﻿﻿﻿﻿Dallas Arboretum’s new attraction brings kids into an interactive garden. ﻿﻿﻿﻿Getting the children in your life interested in learning about nature when they think they’d prefer a theme park is a conundrum facing many parents and grandparents. Thanks to the Rory Meyers Children’s Adventure Garden, there is now a world-class destination in Texas that offers a solution. 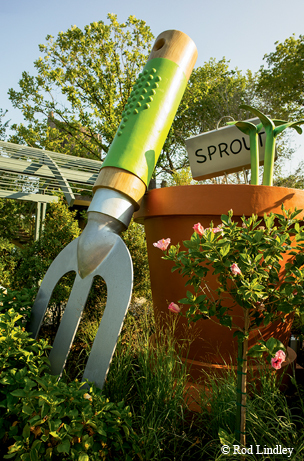 The Dallas Arboretum’s latest attraction is a natural wonderland designed to delight and inspire the child in all of us. The new eight-acre garden contains more than 150 interactive exhibits in 17 indoor and outdoor galleries that incorporate state and national science educational standards. But don’t tell the kids! They’ll never know it as they wander through this state-of-the-art facility that will engage them in the natural world, entertain them with technology and educate them along the way. The garden is billed as a “museum without walls” and contains spectacular exhibits including a native Texas wetland, a 240-foot skywalk through a tree canopy and an energy exhibit that uses water pistols and sun blasters to teach energy concepts. The creative use of technology to engage visitors in the natural world will leave even the most tech-savvy child in awe. ﻿Kids can explore galleries on plants, animals, energy and habitats. The centerpiece of the Exploration Center is an OmniGlobe, one of only five in Texas. The 5-foot-tall electronic wonder features a touch screen that transforms the sphere into a high-tech display that demonstrates continental drift, ocean currents, population density and ecosystems. With a touch of a button, you can see real-time weather data displayed all over the globe. Another program shows viewers what Hurricane Katrina looked like as it formed and swept across the Gulf of Mexico and on to land. Photography buffs and children alike will marvel at another display where a video screen with a spin browser allows visitors to control extreme close-up views of bees pollinating flowers, hummingbirds in action and mushrooms sprouting from a forest floor. The garden was carefully designed to appeal to children of all ages and features age-appropriate exhibits and displays. The First Adventure walled garden provides a safe place for toddlers to play and includes a topiary caterpillar maze, a sandbox, giant acorns, insect displays and a plant petting zoo. Other areas appeal to older children and teach more complicated concepts through a wide variety of teaching tools. The design for the garden involved education experts and science teachers. State and national science standards were reviewed, and lessons that could best be taught in an outdoor setting were selected for the displays. Southern Methodist University’s Graduate School of Education was also involved in the academic design and will be evaluating and researching the effectiveness of the garden on children’s learning of science. The Dallas Arboretum hosts about 100,000 children a year in its education programs, a number that will no doubt increase in years to come. The ongoing relationship with SMU will provide research, analysis and formal evaluation of the garden’s educational effectiveness. The garden has been years in the making, and Maria Conroy has been involved since the concept was first discussed 17 years ago. At the time she was a kindergarten teacher who volunteered to serve on a committee exploring the idea. Now she is the Dallas Arboretum’s vice president for education and has been involved in every facet of the garden’s development. Her experience over the years interacting with city kids who often have little understanding of natural places convinced her of the importance of providing a place where children can explore, learn and discover the beauty of nature. While the educational aspects of the garden may be important to parents and teachers, the real draw of the garden is that it’s just plain fun in a beautiful outdoor setting with a spectacular view of White Rock Lake. The garden is on the southeastern shore of the lake at 8657 Garland Road in Dallas and is open from 9 a.m. to 5 p.m. seven days a week. You can buy tickets online at www.dallasarboretum.org.